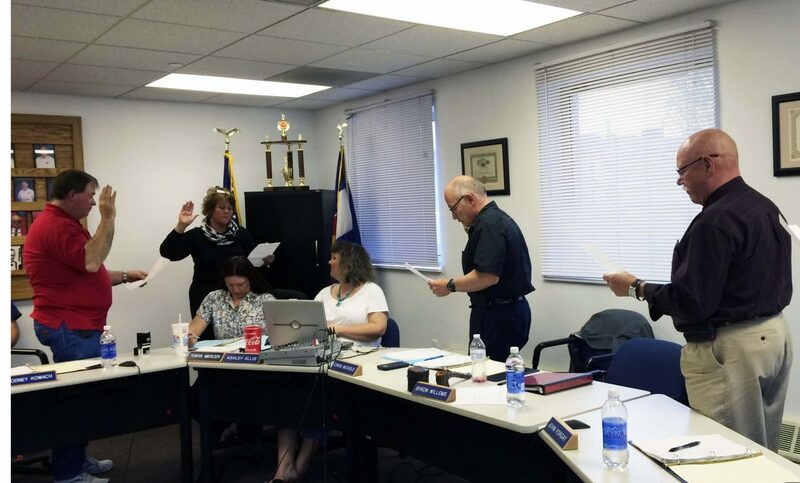 Moffat County Clerk and Recorder Lila Herod swears fire board members into office for the 2014-16 term. Pictured, from left, are Rodney Kowach, Herod, Chris Nichols and John Forgay. Board member Tony Maneotis is not pictured. Craig — The Craig Rural Fire Protection District Board announced a change in leadership at their monthly meeting Thursday. Board member John Forgay will become the new president, and the board requested the resignation of standing president, Byron Willems. Willems owns Craig Fire and Safety, a large provider of firefighting equipment in the region. After a heated election, the three incumbents — Forgay, Chris Nichols and Tony Maneotis — running against district resident Bruce Timberg kept their seats. Timberg ran on a controversial platform, saying the board was keeping secrets and needed to be more transparent. Four times as many voters than the last election drew cast their ballot May 6 in this year’s district election, and voted to keep in the existing board members. But Willems, president for eight years, did not take the board’s victory quietly. On his Facebook page, he called for a boycott of businesses that posted Timberg’s campaign signs in their windows. This caused outrage in the community. The fire board and department distanced themselves from the comments and pressed Willems to apologize. But Willems stood by his Facebook comments, saying they were his own opinion and should not be taken to represent the board. The board publicly came out against Willems’ conduct. Willems “has stated that was his personal opinion. But the conduct we are referring to is when it can be construed as representing the fire board or department,” Nichols said. At a special meeting Tuesday, the board held a discussion with Willems, and he refused to back down from his statements, so the members planned to take a no-confidence vote Thursday. The board has no power to remove or sanction Willems at this juncture. His departure must be voluntary. The board then voted, 4-0 (Willems was absent; he had been excused from attending the meeting because he was traveling), in favor of requesting a letter of resignation from Willems. “I would like to say (I) respect the contribution (Willems) has made to the district over the 30 years,” Nichols said. Even so, it was in the community’s best interest for Willems to step down, Maneotis said. The board will need to wait for Willems’ official resignation before seeking a new member to appoint. “It’s kind of up in the air right now,” Forgay said. Willems said earlier in the week that he would trust the board’s decisions and wishes and step down if they asked him to, but he was unavailable for comment at press time.